Black-ish is back after a short break! “ToysRn’tUs” is a great return to form for the show. It feels like a typical Black-ish episode––Dre and Bow get caught up in a political fury while the kids do their own thing––but “ToysRn’tUs” turns Black-ish’s critical eye on itself. After Diane receives a white doll for her birthday, Dre and Bow are motivated to do something about the lack of black representation around them. They both have good intentions, but in typical sitcom fashion, their own issues are driving them more than their actual desire for change. Bow constantly has her career undermined, and seeing the many white female doctor dolls on display only encourages her place as an outsider. Dre, on the other hand, recognizes that his job puts him in a rare position to actually put diversity on display. While this episode seems like another social justice lesson, it’s really about Dre and Bow’s insecurity. As Dre narrates at the beginning, children these days have more choices and role models to look up to. The Johnson family even has the privilege and resources to help their kids reach any goal they want. But, there are still limits to that. It’s understandably frustrating when you think progress has been made, but you can’t even find a black doll that isn’t a slave or civil rights character. The conversation they have at the end of the episode makes it clear that, although media representation is important, what Dre and Bow really want is to break these limits for their children. 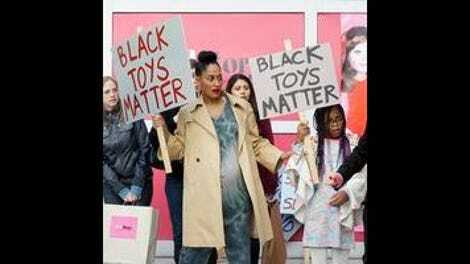 Bow’s “Black Toys Matter” and “Misty Nope-land” signs drive home just how over the top her protest is. Diane’s reluctance to participate makes it entirely clear that she could not care less about the diversity of dolls in the store. Thanks to the naively positive Patrice (played by the incredible Casey Wilson), there’s a wonderful balance between Bow’s politics and the episode’s comedic antics. In the end, Bow is fighting for more intersectional representation at a store that believes in female empowerment, but doesn’t even offer its female employees benefits or days off. Representation might not be the most important issue here. Eventually, Bow realizes that she has to change the method of her parenting to protect Diane from the lack of representation around her. Diane doesn’t need a doll to tell her she could be a doctor or karate master––she just needs a pair of nunchucks. Dre, on the other hand, had his boxable pitch selected and decides it’s the perfect moment to do something about representation. At first, this seemed odd. Dre is the head of the urban division; hasn’t he been creating ads that focus on people of color? But the episode hits on something deeper by revealing that Dre is a colorist. He has “beige rage” and has a preference for light-skinned black people who look close to white. Of course, Dre has created ads with black people in them, but the pattern is clear. Black families that simply mirror white ones make up the majority of his ads. While Dre thought his preferences were limited to chocolate, lattes and basketball team picks, he’s actually guilty of perpetuating a lack of diversity in a very real way. Colorism is a topic the show has touched on before, but this is the first time they’ve really brought up #teamdarkskinned and #teamlightskinned. Sadly, Ruby’s plot with Junior, Zoey, and Jack feels like an afterthought. Ruby isn’t even particularly hilarious as she and Junior sail to victory. It doesn’t entirely make sense that Ruby’s particular insults here would drive Zoey and Jack to try and participate in the competition, but it’s worth it to see Jack’s unearned victory smack talk. The show has always done well building out Ruby’s world and making the characters within it feel like more than background props, but “ToysRn’tUs” doesn’t manage to do that. The other competitors are just there to have Ruby’s insults bounced off of them. It’s just a shame that the insults this episode don’t provide much entertainment. “This white doll is beautiful.” The second Bow said this, I heard my mom saying the same thing at nearly all of my childhood birthday parties. Things that require careful observation of the black/white ratio: everything, restaurants, movies, and cereal choices. Dre has been on probation since he was hired. Sassy Sadie and Sassy Selma. A runaway slave and a civil rights activist. They both have lanterns, but for different reasons. I’d really like an online short that’s just Ruby shopping at Forever 21. Casey Wilson was such a delight in this episode! Her delivery of the line “pioneer women” made me wish she didn’t have a restraining order against Bow at the episode’s end. I’d love to see Patrice pop up in more places. Jack can’t play spades. He knows what he did.